On the left is a picture of plain old Angelina Jolie. But on the right…well we’ve got Angelina after she’s been through the Taaz virtual makeover service. The service, which launches today, uses some of the same tricks as many of the Flash-based photo editing tools we’ve covered in the past. Taaz has added proprietary facial recognition software so that it can, for example, figure out where your lips are when you want to put on lipstick. 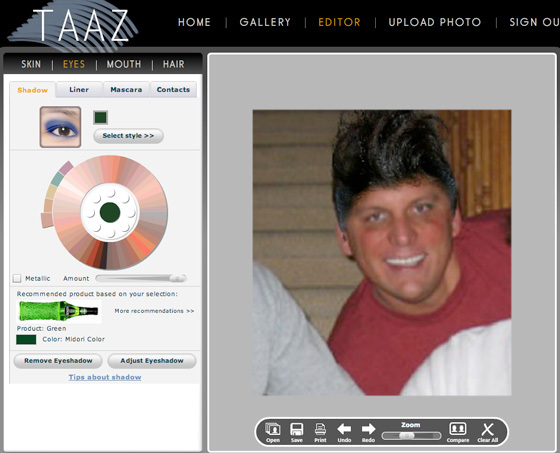 Taaz also differs from normal photo editing tools in that it is specifically set up to help users (mostly women) see how they might look with different hair, eyes, makeup, etc. Finished makeovers can then be shared with other users, rated, commented, etc. The tools are dead simple to use (thanks, Adobe) and I had a lot of fun testing the service. See the image below for me with cool hair and a lot of red stuff on my cheeks. They’ve also included a number of original articles on beauty and style, and helpful hints like this one: “Contrary to popular belief, matching your eye shadow to your eye color enhances your eyes, making them pop.” Good to know. The company is based in San Diego, California. They’ve taken two rounds of financing – a seed round from UCSD vonLiebig Center and a Series A round from iSherpa Capital and Crawley Hatfield Capital. Taaz was founded by David Kriegman, Satya P. Mallick, and Kevin Barnes.